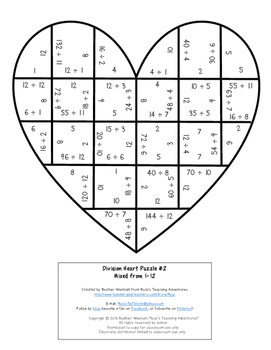 DIVISION Valentine's Day Math Center, Game, or Activity - Make a FUN Card! 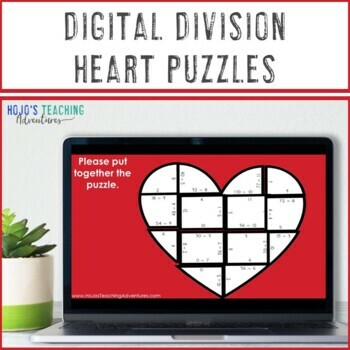 These division heart math puzzles make it quick and easy for teachers to provide hands on games that meet the needs of all students. Use them for Valentine's Day, Mother's Day, Father's Day, Grandparents Day, or anytime you want to show the love. They work great as activities, centers, stations, or games. With a no prep option - these are the perfect last minute resource for your 3rd, 4th, or 5th grade students! WANT TO SAVE SOME MONEY? Grab my DIVISION HOLIDAY & SEASONAL MATH CENTERS BUNDLE to save over 30% and have great downloads to use all school year long. • I bought this product because I thought it was cute for Valentine's Day, but as I watched my fourth graders working on it I saw how challenging and thought-provoking it was! Great problem solving and perseverence activity! • Challenging enough that my students couldn't rush through and complete in a hurry! • This was a wonderful activity that really challenged my 3rd grade mathematicians. Some even asked if they could borrow the puzzles to bring home over vacation to challenge their siblings! Great product! • I really love this hands on division puzzle!! The students are able to practice their math facts in a unique way. Points for creativity!!! • Thank you for these! I'm always searching for fun, new ways to incorporate math learning and these are great! 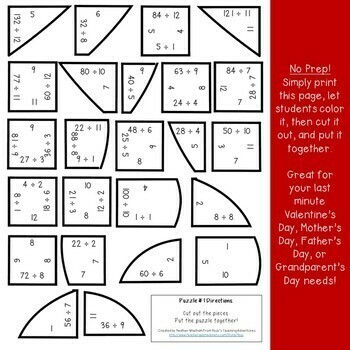 • These are super cute to implement around the holiday time, but still has the students practicing their facts. 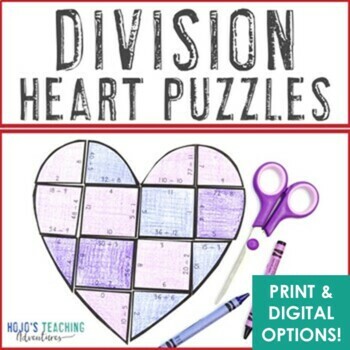 If you want division puzzles you can use at ANY time of year, check out these Division Magic Square Puzzles!